For all the alarmist talk of creeping fascism which followed the election of Donald Trump in November of 2016, remarkably little has actually happened over the last few years to justify the view that if the post-Cold War liberal system is collapsing, that It is being replaced by illiberal authoritarianism. It is a testament to the cognitive dissonance between words and reality that so much of good liberal opinion is shocked, shocked, by the images emerging from Spain featuring police battling with demonstrators for control of ballot boxes during Catalonia’s recent referendum. It has become an article of faith among the liberal comentariet, that even if there are “problems” with the way the Catalans have gone about it, Spain’s response to the referendum is unjustified and counterproductive. It will, it is alleged, create the very majority for independence that Madrid fears. Instead of resorting to force, wouldn’t it have been better for Madrid to wait for the referendum to be conducted, even if it was illegal, before making a decision? It is unclear if the authors of these suggestions are products of historical ignorance and political naivety, or actually fail to see a problem with Catalan secessionism. The historical precedents show that to allow an illegal referendum to proceed is to concede its de facto legality. The referendums held in Slovenia in 1989, on subordinating all Yugoslav laws to ones passed by the Slovene assembly, and then in 1990 on independence, were both blatantly illegal under the Yugoslav constitution. This was a position maintained not only by the Yugoslav Constitutional Court, but also by the United States and the European Community. Nonetheless, by allowing them to take place unmolested, the government in Belgrade ceded legitimacy to the Slovene secessionist such that American and European mediation efforts focused on persuading the Slovenes not to secede rather than contesting their right to do so. And when the Slovenes actually implementing their secession, by launching attacks on Yugoslav Army personnel within their territory, many of them teenage conscripts, it was the Yugoslav army that was treated as an aggressor, and the international insistence that “both sides settle the matter without a recourse to force” all but recognized Slovene independence. Madrid has seen this show before. For those who argue Madrid should have tried diplomacy, such an approach requires a partner interested in a settlement. The Catalan nationalists do not want an amelioration of the conditions that make their membership in Spain intolerable, because it is their membership within Spain, rather than any specific grievances, that is intolerable. As such every move is tactical, and concessions are not designed to settle matters peacefully but rather to place Madrid in the wrong. The violence is a case in point. It is alleged that Madrid used excess force. What is missing is any comprehension of how 800 people could be injured in a Western European country inadvertently. The answer is that the Catalan nationalists see any violence or casualties as playing to their advantage, and as such have deliberately provoked violence to provoke exactly the sort of Solomonic “both sides are in the wrong” boilerplate nonsense being parroted by ignoramus who should know better. The referendum was designed to provoke violence. It was not merely unconstitutional, as if this is a matter of legal disputes. It is occurring in violation of court order, making it a criminal offense, and everyone taking part guilty of contempt. To remove the niceties, how would critics respond if the state of Alabama were to announce an intention to hold a referendum on disenfranchising African Americans, and proceeded to go forward even when the US Supreme Court ruled it illegal. Would anyone have demanded Barack Obama “refrain from hasty action” and allow the vote to go forward in the hope that enough Alabama whites would vote the proposal down before taking action? The Spanish government has a moral and legal obligation to uphold not just its own authority but the rights of Spanish citizens under their constitution. Those rights are threatened by a referendum that if successful would strip them of Spanish citizenship. Here lies the final mystery of liberal support for Catalan nationalism. Nationalism is inherently majoritarian. It not only is a movement of a regional majority, but it associates ownership of said region with that majority, implicitly relegating everyone else living there to the status of transient intruders or traitors. Unionist Catalans, like Unionist Scots or pro-Canadian Quebecois are “brainwashed” to be dealt with by reeducation, if not of themselves, then of their children. As for outsiders, English speakers in Quebec, Serbs in Croatia, or Spaniards in Catalonia, they are to be forced to chose between assimilation or departure. There is a reason secession generally leads to at the very least “soft” ethnic cleansing of dissenters. The example of Quebec is instructive, not least that until the eye of suspicious Quebecois nationalism turned towards Muslim immigrants in 2012, the cause of Quebec was the cause of the left in Canada. The governments of the Parti Quebecois, which have not won a majority of votes cast in any election in forty years have made it illegal for French parents to have their children educated in English language schools, and extended that to children of mixed-language couples. More recently they have even made efforts to ban the use of private schools. It is quite clear what independence would mean for English Quebecois. Either a willingness to disappear, or a decision to pack up and leave. That French Canadians are a national minority even while they are a regional majority has tended to justify left-wing sympathy for them as a “weak” and therefore under the rules of identity politics, virtuous side. But it is usually exactly those national minorities that are regional minorities which exhibit the most virulent nationalism, as they see minorities within their region as trojan horses of central power and assimilation. Ironically Southern Whites in the United States, the great boogeyman of the American left, actually are one of the strongest examples of this. Rather than seeing themselves merely as “white” Americans living in certain states, they have their own cultural and national identity with its own mythology(around the Civil War), pantheon of heroes, and sense of belonging. While it is no longer racial, anyone now can be accepted provided they accept a mythology which is implicitly racist, and the veneration of a pantheon of heroes who in many cases were explicitly so, it is seen as holding a sense of “ownership” of the regions, under which South Carolina would not be South Carolina if it were filled with the population of New York. It is precisely this view of outsiders as a potential fifth column which drives the anti-democratic behavior of Republicans in North Carolina, as politics is seen not as partisan competition between parties, but as an assault on the existence of the state itself. Catalans are more sympathetic, mostly because they haven’t tried to explain their grievances. This has been wise, given that they don’t really have a compelling set, and their case largely focuses on historical grievances from a narrative of the last 600 years which paints a picture of constant Spanish exploitation and oppression going back to the Union of Aragon and Castile in the 15th century. Due to the lack of much more than financial grievances, Catalan nationalism has had to become explicitly anti-Spanish, and has given moral cover to those who frankly would rather than not pay taxes to support poorer Spanish citizens. Catalans have been lucky in the fact that most international observers don’t try and understand the motivations for secession. Europe has enjoyed such a luxury of meaningless government for two decades, especially in the West, that people have been free to revel in “principled” positions, such as “self-determination” without considering that self-determination for one group means the loss of it for another. 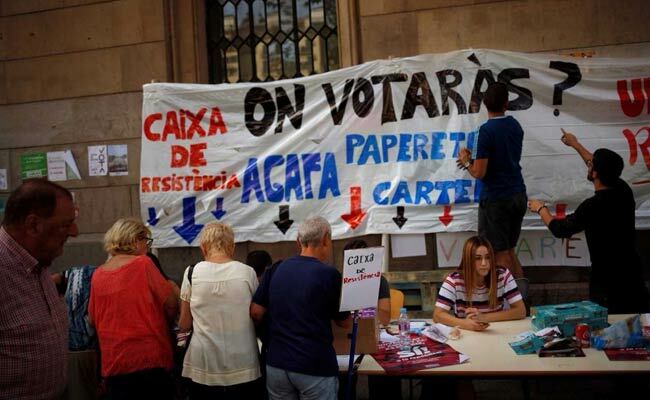 As such, Catalans are assume to have the right to hold a referendum because they want to. Spanish law, International Law, EU Law, the rulings of Courts, none of that matters if someone wants something. Outsiders are right to be concerned about what is going on in Spain. But that is because what they are seeing is a determined nationalist group trying to use their preconceptions against them. The secessionists know they cant beat Spain domestically. Their only hope is to force international mediation, and that requires bodies which they have obligingly sough to provide. To “blame both sides” or call for the Spanish government to “refrain from the use of force” is to give in to extortion, reward criminal activity, and set a dangerous precedent. Spain had little to no choice to do what it did, and ill-informed concern trolls complaining about methods are serving as useful dupes.